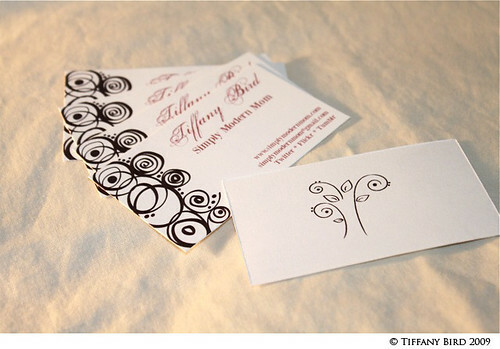 Mommy cards… business cards… blogging cards… info cards. Whatever you want to call it. I’ve been working on designing my own. It took three days working on it a few minutes here a few minutes there with Kaye or Elle on my lap. After three versions, I finalized with this one. What do you think? It’s simple with a small touch of design. It matches the colors of my site. And it has my logo on the back. Leaving some room for me to write a note or jot down my phone number for someone. I’m excited to hand these out to friends, family, fellow bloggers, and just about anyone I meet. I also plan on attaching them to gifts or products I sell. I printed a few on cardstock on our home printer. Maybe I’ll get around to taking it to a print shop sometime this week to have some printed professionally. If you made something inspired by Simply Modern Mom, please upload pictures of it in our Flickr group to show it off to everyone. You may be featured on Simply Modern Mom. There is a place online where you can print out business cards like these for near about free. http://www.vistaprint.com. I had seen them before in the past. Might be something that would interest you. I love these! I am loving your site! We need to do a blog swap or something!!! Email me if youre interested! the squirrels are my favorite mommy cards. all the cards are made from sweet little watercolor paintings. find these cards to be different than what i see around.